An app that lets audience members experience Melbourne General Cemetery like never before? Victorian College of the Arts Lecturer in Theatre Robert Walton explains more. This weekend (20–21 May 2017) at the Melbourne General Cemetery, artist Jason Maling and I will test the latest edition of our transmedia app experience Vanitas. Blurring documentary with fiction, Vanitas is a reflective thriller about life’s great mystery: death. Experienced through their own smartphone and decrypted through the secret language of flowers, each visitor will embark on a self-guided walk through Melbourne’s oldest modern cemetery. Alone. Intrepid audience members will listen to the app as they wander towards a rendezvous at the centre of the cemetery. It’s a meditative experience that asks you to listen deeply and look closely at the world around you. In Vanitas, not everything is as it first appears. A vanitas painting portrays collections of objects symbolic of the certainty of death. We were inspired by a painting from 1700 by Dutch artist Rachel Ruysch called Vase with Flowers (above). Ruysch’s floral vanitas depicts blooms just passing their best, on the cusp of wilting or being eaten by bugs. Her mysterious painting, like all vanitas pictures from that era, reminds us that all living things fade, and that our objects will outlive us and become the last traces of our daily lives. In much of Australian culture, death remains taboo. For a variety of reasons, we are unable or unwilling to talk about it. In fact, we often go about our lives as if death is a fate that will not befall us personally. Australia also has the second highest uptake of smartphones in the world. Hence, we have made a smartphone app as a vanitas for our own times. 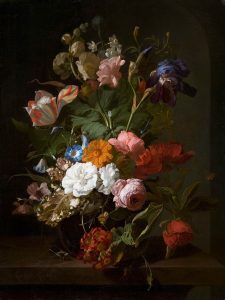 The interface itself is based on Ruysch’s painting with each flower representing an episode in the story. Like the flowers in the painting, you are drawn to some episodes first and then chance upon others along the way. The shift between guided and random order allows the audience to weave their own connections with the threads of narrative we present. The story mixes documentary, autobiography and fiction and is told wholly through remixed audio fragments taken from interviews with a variety of experts on the themes of vanitas, flowers, life and death. We find out about the secret language of flowers, witness a cremation, and talk to botanists, historians and professionals from the death industry. We are lucky to have Southern Melbourne Cemeteries Trust in our city; world leaders in forward thinking about the future of our cemeteries. Those we have worked with from the Trust’s team have been great collaborators and have helped us to understand how death practices have evolved over the last century and how they might develop into the future. What is clear is that Melbourne General Cemetery in Parkville is a place of extraordinary national importance. It is a haunting museum and art gallery of lives past, like the shadow of the city itself. And, with 300,000 people buried there, it’s certainly the biggest venue I have ever played. But the dead are what you’d call a captive audience. On the whole they are very well behaved bunch; they don’t give much back. They seem to be enjoying the show so far, yet we live in constant fear of a standing ovation. The audience on the weekend can expect a meditative experience exploring themes of death and transience. Ticket holders can arrive any time between 10am and 4pm on their chosen day. Audience members will be asked to come with a fully-charged smartphone (Apple or Android) with an Australian mobile number, email address, access to the internet (there is no WiFi in the cemetery) and headphones. Once booked, they will be sent an email with information on how to download the Vanitas app before coming to the cemetery. Banner image: Jason Maling and Robert Walton.